Many people in the mobile space use their smartphones for listening to music, and as such Bluetooth headset maker Jabra has responded to the need for performance speakers by introducing the Jabra Solemate Bluetooth speaker, a multifunctional Bluetooth speaker that enables sharing and broadcasting music with anyone, anywhere and at any time. The Jabra Solemate Bluetooth speaker features strong deep bass via an integrated subwoofer, vibrant acoustics via dual tweeters, and connects to any device that can play music either wirelessly or corded via Bluetooth tech, UBS cable or 3.5mm audio cable, and plays music clearly and loudly whether connected to an MP3 player, laptop, smartphone, Apple iPad or other tablet. With the Jabra Solemate Bluetooth speaker the user can play music at the beach, in the park, or relaxing at home, and even amplify the volume when streaming YouTube videos or viewing movies, and even turn up the volume on mobile video games and can last up to 8-hours of continuous play. 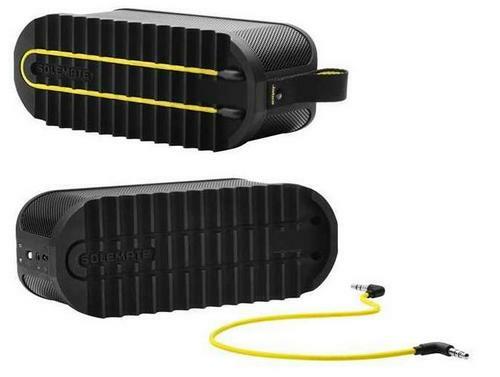 The Jabra Solemate Bluetooth speaker is roughly the size and weight of a soda bottle, so in small and lightweight and has a carry strap along with a rubber sole base which stores the 3.5mm audio cable. The device is also splash, shock, dust and sweat resistant, whilst sturdy enough to handle everyday knocks and bumps. For your viewing consideration below we have an introduction video for the Jabra Solemate Bluetooth speaker, so feel free to head on down and mash that play button to check out the device in action. For those that might be interested in picking up the Jabra Solemate Bluetooth speaker, the device will be in retail stores this month, and available in both black or white models, and commands a price tag of Â£149.99.